I'm making a small departure from my normal Free GM Resource and instead giving you a link straight to a GM's or publisher's website, I'm linking straight to some specific free offerings on DriveThruRPG. Last week I was excited to find out that Inked Adventures had a new product: Hand Drawn Large Geomorph Tiles. If you've read all of my product reviews you'll probably remember that I did a review on the original set of geomorph tiles. I really liked the tiles set, but there were just a couple of minor tweaks I wished for. After finding out about this new tile set I reached out to the artist, Billiam Babble, and in the course of a few emails back & forth he offered to give the Frugal GM some complementary product to give away to readers as part of a contest. How fricken cool is that? I haven't figured out the parameters for a contest yet, but I plan on incorporating some of the Inked Adventures tiles as part of that contest. Right now I'm leaning towards people submitting a picture of them clearly using an Inked Adventure Tile in play, one entry per person. I'm trying to figure out a method for bonus entries, but in either case expect detail in an announcement later this week. 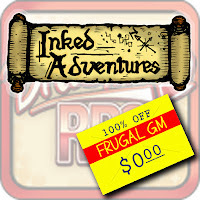 It doesn't help that Inked Adventures is currently running a big promotion on DriveThruRPG where everything is on sale. Now I'm not suggesting you go an purchase any of Billiam's products, but I think if you check out the free downloads you might very well decide to pick something up....and if you do, now is a good time to do it. If anything I'm just trying to point out an opportunity to pick up some free product and if you like it get some more at a discount......and maybe win some free product on top of that. Now if you end up liking the Inked Adventure line and end up purchasing the very product you end up winning, then I'll make sure you get taken care of, either with different product or DriveThruRPG credit in the appropriate amount. The assorted free Inked Adventures products can be found here. I have one simple request if you download and use any of these files: please make sure to fill out a feedback sandwich) as well. I can tell you from experience that product reviews really help motivate a small publisher in putting out new product or making tweaks to older ones. brief review on the item. At a minimum, click the appropriate number of stars. It'd be cooler if you left some positive feedback.